Shelby County Commissioner Julie Ehemann reads a proclamation for Colt during his retirement party. 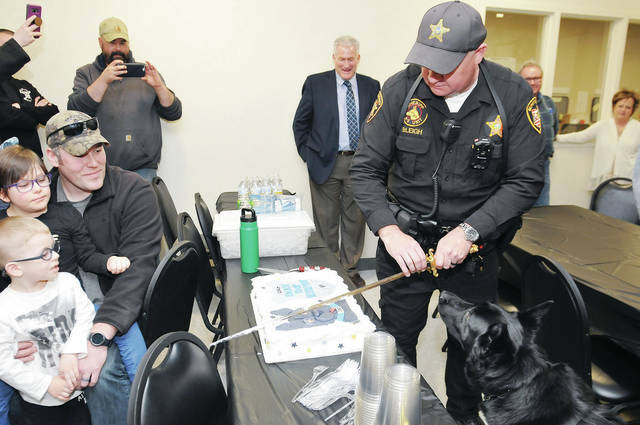 Shelby County K-9 Deputy Colt watches as his partner Deputy Frank Bleigh cuts Colt’s retirement cake with Shelby County Sheriff John Lenhart’s sword Wednesday, March 20. Shelby County Sheriff’s Deputy Frank Bleigh stands with his retiring police K-9 Colt, right, and Colt’s replacement, Bandit, during a retirement party for Colt complete with a personalized cake, a Colt slideshow and treats for both dogs. SIDNEY — Shelby County Sheriff’s K-9 Deputy Colt joined the office in 2010. “He has been very active in assisting the Sheriff’s Office and other agencies in many apprehensions, recoveries and seizures during his career,” said Sheriff John Lenhart. • Locating a missing dementia patient in rural western Shelby County during inclement weather. • Apprehension of a felony suspect fleeing from deputies and resisting arrest. He was physically subdued by Colt. • Assisted in tracking and apprehension of an armed robbery suspect in Anna. • Detection of 385 pounds of marijuana contained in a safe. • Tracking and apprehension of two suspects from a “smash and grab” burglary at cell phone stores. • Part of the pursuit of a fleeing violent felony suspect that exchanged gunfire when pulled over by a deputy and was featured on a national law enforcement television show. • Located $35,000 worth of stolen jewels from an armed robbery/pursuit which began in Beavercreek. 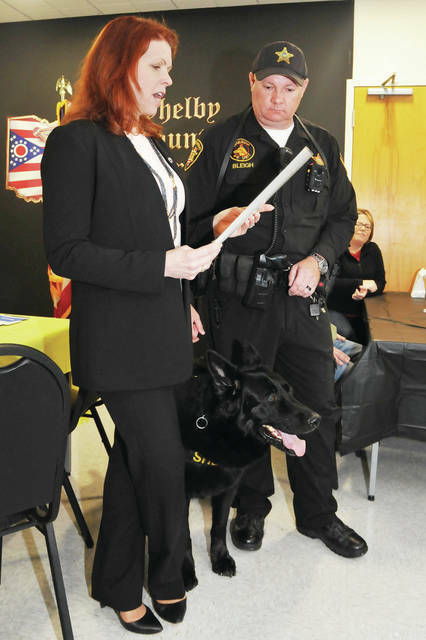 • Has assisted/participated in duties in several nearby counties including Hardin, Auglaize, Mercer, Darke, Miami, Champaign, Preble, Butler, Montgomery, Logan and Allen. “K-9 Colt has been in the public eye in more ways than just enforcement. He and his handler Deputy Frank Bleigh are active in several community events and demonstrations,” said Lenhart. “Colt has visited Boy/Girl Scouts, nursing homes, Shelby County Fair, Country Concert, local festivals and many schools. Colt bridges the gap and abolishes the fear and negative stigma that some children may have with dogs and peace officers. While Colt is a trained police canine and sworn Deputy Sheriff, he is in many ways not only a fellow peace officer, but a beloved member of the Shelby County Sheriff’s Office. SIDNEY — Shelby County Sheriff’s Deputy Frank Bleigh has a new partner. K-9 Colt, 12, who has been a deputy for 10 years and Bleigh’s partner, retired on Feb. 19. When Bleigh reported for duty on Feb. 26, he was joined by K-9 Bandit, 3. Colt was honored Wednesday, March 20, at a retirement party attended by the Shelby County Commissioners, deputies, family, friends and other K-8 officers. Bandit was also introduced as the newest deputy. While Colt is no longer on duty, he is now the Bleigh’s family dog. Bleigh purchased Colt from the county for $1. Bandit also resides at the Bleigh home with Colt, family dog, Maggie, and a cat. 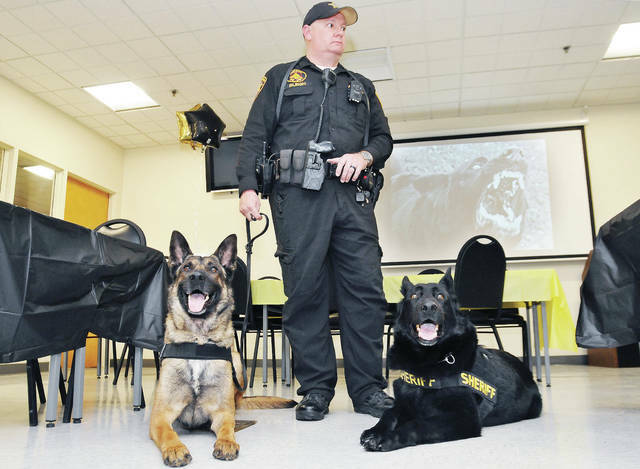 “We couldn’t operate our office without the K-9 officers,” said Sheriff John Lenhart. “The city police can use a saturation patrol. We can’t do that. The K-9s are the deputies backup. “The K-9 officers live in the home with the deputy and become just like a kid in the family,” he said. Lenhart said the partnership with all offices who have K-9s is a benefit to all departments involved. Bleigh told the crowd that he “got used to the doggy noises in the car” while they were on duty. Bleigh’s wife, Lori, has enjoyed the addition of Colt to their family. Lori said the addition of Bandit to the household to a little getting used to. On the first day of Colt’s retirement, he watched “Dad” leave the house without him, said Lori. When Frank and Bandit arrive home after their shift, Bandit greets Colt with “puppy kisses” said Lori. Shelby County Commissioners Bob Guillozet and Tony Bornhorst said the K-9s are a benefit to the department. There’s been a K-9 unit at the Sheriff’s Office for 30 years. Bornhorst said the K-9s visit 4-H Club meetings, schools and other places in the county so the residents can get to know them. Frank said he enjoys being a K-9 handler for the Sheriff’s Office. Frank said he’s always had an interest in the K-9s with the department. When a deputy left the position as a K-9 handler, he was asked to join the group. And the best part of being a K-9 handler? Reach the writer at 927-538-4822.